An Alabama eviction notice is a written statement from a landlord to the tenant that details the terms for them to vacate the property, also known as an “unlawful detainer”. The lease violation is required to be stated in the notice. For late payment of rent, the landlord will need to enter the total amount due including any penalties. The tenant has the option to comply or vacate the premises if the notice is curable. If the tenant remains on the property without complying then the landlord may file an eviction action in the Judicial Court of where the property is located. 7-Day Notice to Quit (Non-Payment of Rent) – Grants a tenant seven (7) days to either pay the total amount owed to the landlord in rent or leave the property. 7-Day Notice to Quit (Non-Compliance) – Gives seven (7) days for the tenant to either fix a non-conforming aspect of the lease or to immediately vacate the premises. 30-Day Notice to Quit (Month-to-Month Lease Termination) – Given to a tenant-at-will to inform them of the landlord’s intentions of ending their rental arrangement. Must give the tenant at least thirty (30) days’ notice. 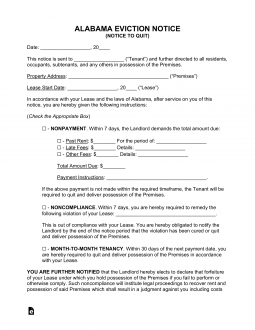 Answer (Form PS-01) – Used by the tenant to give a response to the Judicial Court of an eviction filing. Must be sent within seven (7) days of being served that there is a case filed against them. Complaint / Statement of Claim (Form C-59) – Form that the landlord files with the Judicial Court in order to start the eviction process. This form, along with a copy of the notice to quit, will be necessary to start the proceedings. An eviction in Alabama should be filed in accordance with the Uniform Residential Landlord and Tenant Act and may be filed by attorneys or individuals that choose to represent themselves. Step 2 – Fill-in the document and send to the tenant. This is recommended to be done in Certified Mail so that the landlord receives confirmation that the letter was seen by the tenant. Step 3 – After the notice period, the tenant will have either paid/conformed to the demands, left the property, or is still there. If the tenant is still on the property the landlord will need to file a Complaint / Statement of Claim (Form C-59) with the Judicial Court Circuit – See Locations. Step 4 – After it has been filed the landlord will need to serve the tenant the information about the case filed against them. This may be completed by using the Sheriff’s Office to send a Certified Letter. After the letter has been received by the tenant they may have 7 days to file an Answer (Form PS-01). Step 5 – At this time the court will give a hearing date and both parties will be expected to appear. A judgment is usually given and if the judge rules in the favor of the landlord the tenant will have 7 days to appeal the order. When writing the notice to quit, it is important to obtain the lease that was signed between the landlord and tenant to obtain details about the tenant(s). In the first part of the notice to quit, the Tenant(s) name(s) should be entered along with the address of the property and the date the lease was signed. Non-Payment of Rent – Check the first (1st) box and write who should be paid if the tenant is going to make payment on the back-rent along with the amount. The landlord should write the dates that the tenant is late (start and end). Violation – If there has been a material non-compliance then the second (2nd) box should be checked along with a brief statement of the violation. If the landlord is ending a tenancy at will then they can click the checkbox at the top of the second (2nd) page and write the last day the tenant is allowed to be on the property in accordance with State law (30 days from the notice date). If the tenant is the one that is terminating the tenancy then they may be able to check the respective box and enter the date at which they wish to end their tenancy.